Today is the opening day of the Patras carnival, in Greece, the largest of its kind in Greece, and rivaling carnivals worldwide. So . . . when people feel the blues because Christmas is over and Lent is looming, they get into the party spirit with carnival. Of course, if Lent is not a big deal for you, then carnival will not be important either. But in largely Catholic countries, or enclaves, there is always at least one city – Rio, New Orleans, Venice – where they pull out all the stops. Such places attract huge numbers of tourists these days, but there is still very much a local presence under the schlock if you know where to look. Patras is unusual in that it occurs in a predominantly Orthodox country. You might hear the usual rubbish about how Patras carnival has roots in ancient pagan rituals, such as those to honor Dionysus, but there is general agreement that the starting event of the current Patras Carnival was a ball given at the residence of the merchant Moretis in 1829. French troops of general Maison stationed in the city after its liberation from the Turks were a major influence on the carnival, bringing their own (Catholic) culture and traditions to the festivities. During the 19th century, new arrivals from the newly joined Heptanese, the seven islands (plus smaller ones) in the Ionian sea that became part of Greece in 1864 also added their own regional culture and music. Later on, and as a consequence of the prosperity of the city at the end of the 19th century, the carnival festivities took on a more regular nature. The geographical location of the town and the ever-increasing dominance of the port ensured constant communication with Italy and the rest of Western Europe. Their grand carnivals and the Venetian carnival in particular were especially influential in shaping the festivities, giving the carnival its Western characteristics. The first carnival floats appeared in the 1870s. 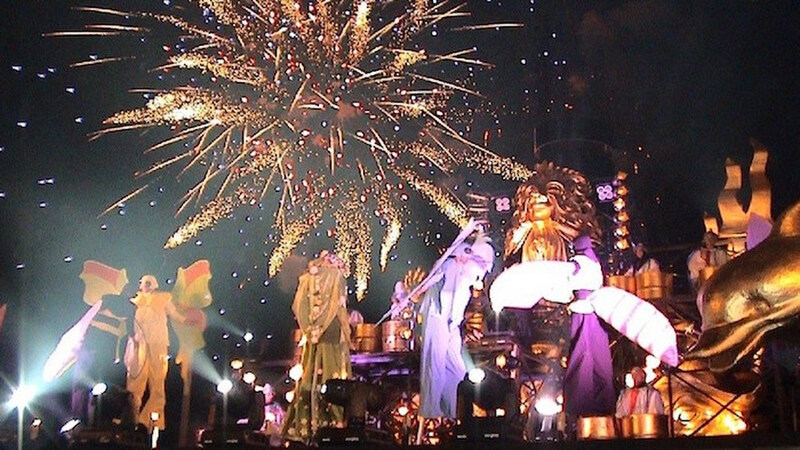 At that time the floats were exclusively the creations of individuals. Later the Municipality of Patras constructed a large number of them. In 1872, with contributions from the town’s wealthy raisin merchants, the celebrated Apollon Theatre was built by Ernst Ziller in George square. Carnival dances were hosted there, and they continue to be hosted to this day. George square is the central location in carnival celebrations and the Apollon theatre serves as a backdrop to most major carnival events, including today’s opening ceremony, making it emblematic not only of the carnival but of the town itself. In 1880 on Saint Anthony the Great’s day (today), the first “mpoules” appeared. These were groups who were disguised and anonymously poked fun at friends and other people in the neighborhood. This custom has now disappeared. As the historian of the Patras Carnival, Nikos Politis, points out, beautiful carnivals were organized during the belle époque in the years 1900, 1907, 1909 with attendance for the first time of individuals from all social classes and origins. This period also gave birth to the egg-war custom. Wax eggs were made stuffed with confetti using specially designed machines which the carnival participants threw from balconies. Although this custom has disappeared, it is considered to be the precursor of the chocolate war which still persists. Bars of chocolates are thrown by revelers on floats or amongst groups at parties. The developments of the following decade were not favorable for the carnival; the continuous wars and conflicts (Balkan wars, World War I, Asia Minor campaign) economic crisis and desolation to the city. In the first postwar years the situation did not improve perceptibly, but the years 1938 and 1939 saw revivals. Nevertheless, World War II and the subsequent Greek Civil War brought interruption. In the 1950s the carnival returned. In the same period the Greek cinema showed scenes of the carnival in its films. Other historic scenes can be seen in prewar films. 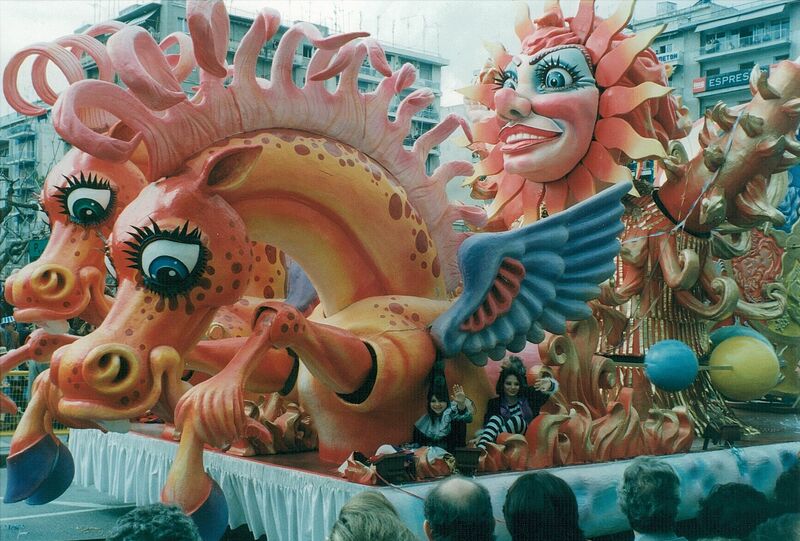 In 1966 the carnival was reorganized. The journalist Nikos Mastorakis introduced the Hidden Treasure Hunt, a game in which 94 citizens of Patras and visitors try to find a list of sometimes obscure objects. The first prize was won by a team led by a friend of the carnival from Thessalonica, Alkis Steas, and he started the game the following year, and for decades thereafter, becoming a carnival legend in person and on television. His expressions such as “the Carnival city of Greece”, when he referred to Patras and “be happy” and “keep dancing!” when he referred to the carnival groups, remain catch phrases. In 1974 the modern phase of the carnival began when revelers were convinced to abandon their cars and parade on foot in the streets (until then only floats paraded). 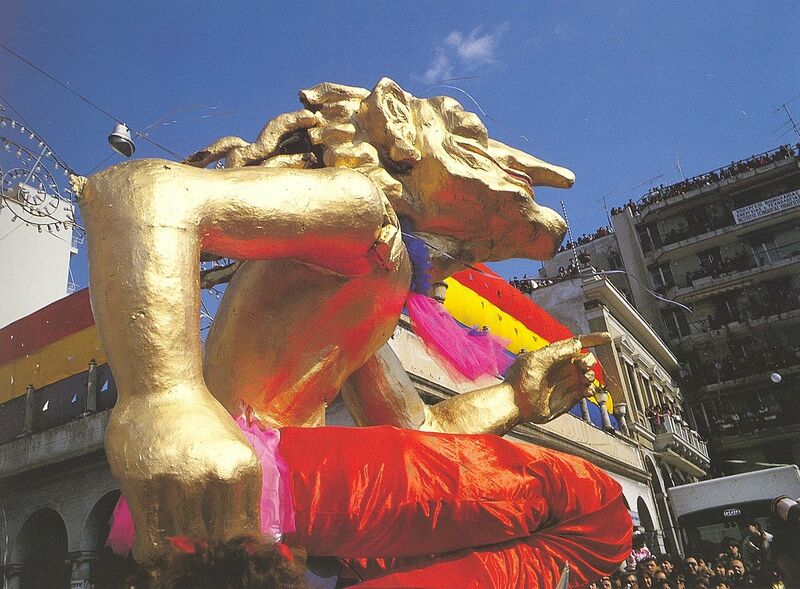 Since then each year the spectacle has grown and the carnival has become enormous with thousands of revelers taking part in the parade as hundreds of thousands of visitors flock to Patras to witness the proceedings. Irrespective of when the Triodion falls, the three-week period preceding the first Sunday of Lent, it is customary for the Carnival of Patras to start on the feast day of St. Anthony the Great (17 January). A town crier appears on the streets of Patras; in recent years this has been a specially constructed float with music. The crier announces the opening with a satirical message and invites the town’s residents to assemble that evening for the opening ceremony in George square. 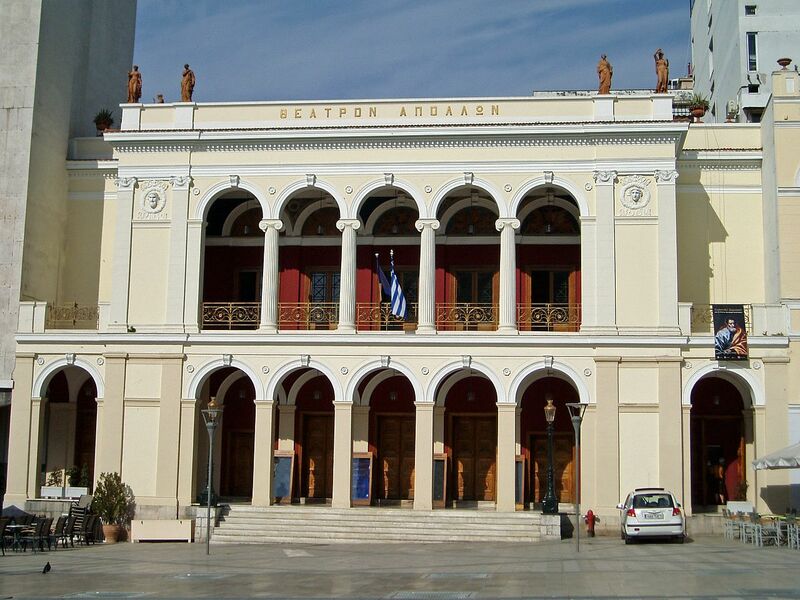 During a spectacular celebration with elements of surprise, as the program is kept secret till the last moment, the start of the Patras Carnival is declared by the town’s mayor from the first-floor balcony of the Apollon theatre. The program usually includes pantomimes, dances, music and fireworks. Patras is a port city that owes much of its growth and wealth to the import and export of raisins. 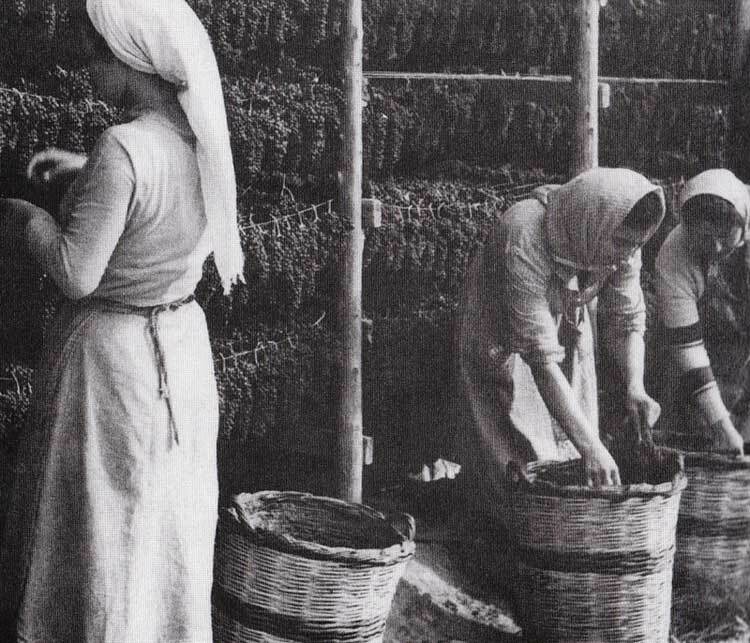 Greece has been growing raisins since antiquity and Patras was one of the first areas where they were grown. 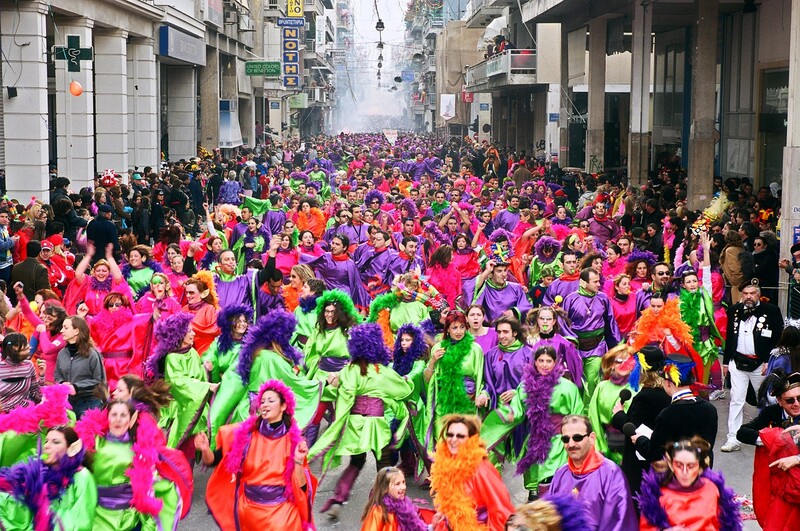 The 19th century, when the Patras carnival was expanding, was a boom time for raisin production and export, reaching 80% of all Greek at one point. So, raisins it is. 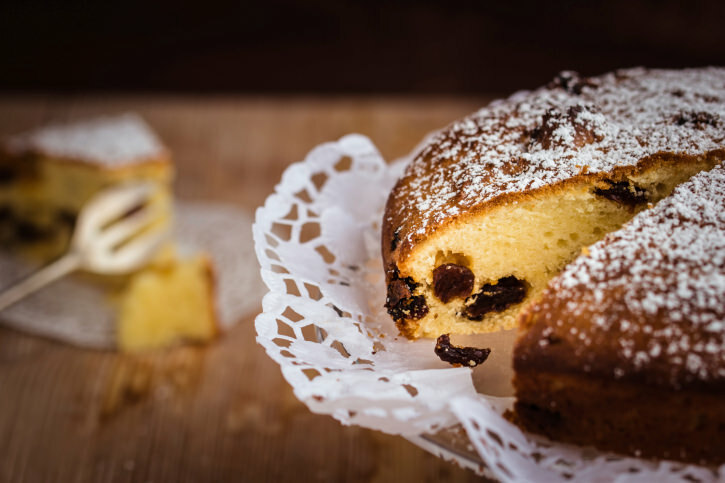 Here is a recipe for Greek raisin cake. Grease a 9 x 13 inch loaf pan. Sift the flour, baking powder, cinnamon, cloves, and salt together into a bowl. Put the butter and sugar into the bowl of a stand mixer and beat on medium speed until well combined. Turn the mixer to low speed and add the eggs a little at a time until they are well mixed in. Still on low speed, beat 2 cups of the dry ingredients into the egg mixture. Add ½ cup of milk and beat together. Add the rest of the dry ingredients and beat for 1 minute, then add the rest of the milk and beat again. Turn off the mixer and stir in the raisins using a wooden spoon, making sure they are mixed in well. Pour the batter into the loaf pan and bake for about 1 hour, or until a toothpick inserted in the center comes out clean. Remove from the oven and let the pan cool on a wire rack for 15 minutes. Turn out on to a serving plate and dust the top with confectioners’ sugar when the cake has completely cooled. Today is the first day of Kunchi in Nagasaki which lasts for three days. Kunchi the most famous festival in Nagasaki. 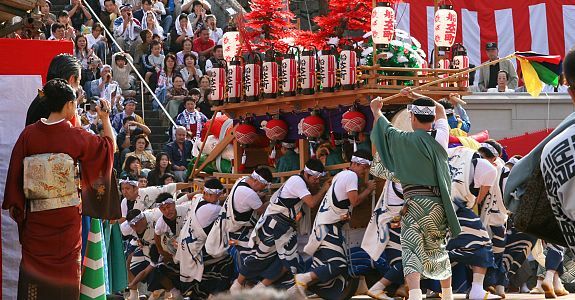 It began as a celebration of autumn harvests in the late 16th century and became a shrine festival when Suwa Shrine was founded in 1642. It was originally set according to a lunar calendar (like the Chinese New Year), but now it is fixed on 7-9 October according to the solar calendar. Another purpose was to check for hidden Christians after the ban on Christianity. This is still evident today in the custom of “garden showing,” when the presenting neighborhoods open up their homes to public scrutiny. 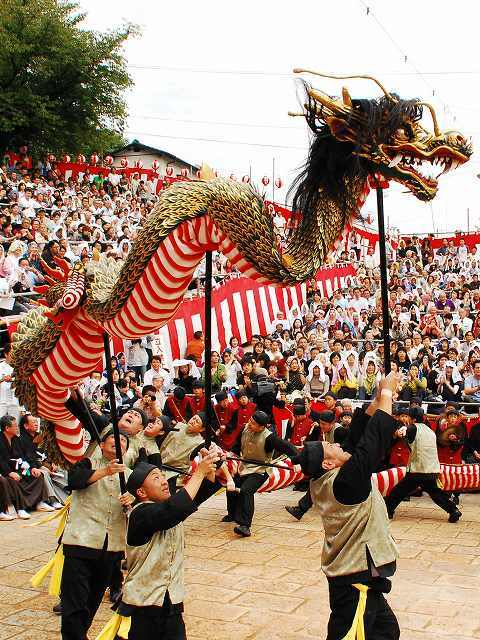 One of the most famous performances of the festival is the “Dragon Dance” which was originally performed on New Year’s Eve by the Chinese residents of Nagasaki. Neighborhoods also create elaborate floats in the shape of boats. Rehearsals for the festival begin on June 1. The word kunchi is probably derived from the word kyunichi, or “shrine day,” although some scholars trace the origin to ku’nichi or “ninth day,” referring to the auspicious ninth day of the ninth month in the lunar calendar. 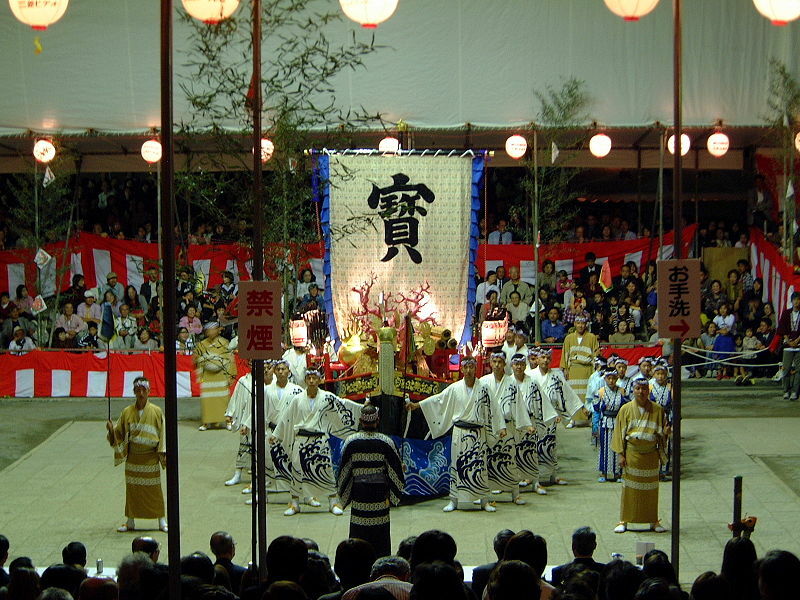 Originally the main event of the festival was Noh drama as was common at festivals throughout Japan at the time. However, after a major fire at the shrine in 1857 the festival became more diverse, with participating neighborhoods competing with one another with their magnificent displays, as well as the introduction of foreign elements including those imported from the Dutch who were there because of the Dutch East India Company. The Dutch were a significant presence in Nagasaki from the 17th century onwards, but they were originally simply observers of kunchi. Reinier Hesselink in “The Dutch and the Kunchi festival of Nagasaki in the Seventeenth Century” describes the relationship of the Dutch with the Kunchi festival. 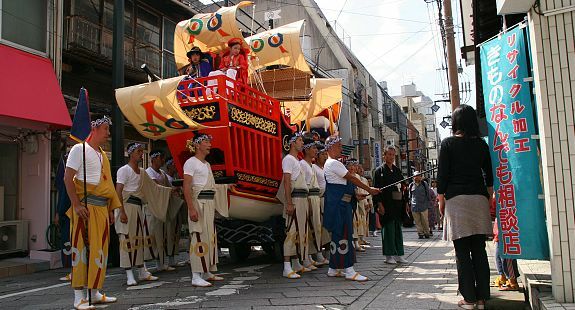 The Kunchi festival of Nagasaki was first celebrated in 1634. As this date indicates, the festival was originally part of the bakufu policy to forge a Yamato spirit for Nagasaki, which up to 1614 had been Japan’s only Christian town. 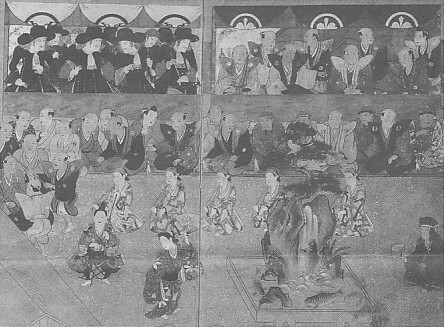 In other words, the Kunchi festival started out as an anti-Christian festival, in which the anti-Christian forces in Nagasaki: the bakufu, Shinto, Buddhism and the brothel wards all joined hands to provide an alternative to the famous Easter processions, which had been performed throughout the city during the Christian period (1570-1614). By the time Kaempfer arrived in Japan in 1690, it had become an “established tradition” for the Dutch to attend the festival. On most representations of the festival we see, therefore, a place in the viewing stands reserved for the Dutch. The main features here are the iwaibune (“celebration ship”) and kenmai (“sword dance”) which, unusually features female dancers with samurai swords. This area is built on reclaimed land and was in the late 17th century onwards an important unloading and mercantile district. The main feature is the jabune (“dragon ship”), which includes a Chinese-style dance telling the story of the Vietnamese princess Anio who arrived in Nagasaki in 1619 to marry the wealthy Nagasaki trader Araki Sotaro. Goto-machi was named thus because Christians from the Goto Islands took refuge there during a rebellion in the islands in 1576. During the Edo Period it was the site of the yashiki or headquarters of several Kyushu clans. It is a relative newcomer to the festival. Their specialty is jaodori (“dragon dance”). Ginya-machi (“Silver Shop Quarter”) indicates the district’s historical roots. 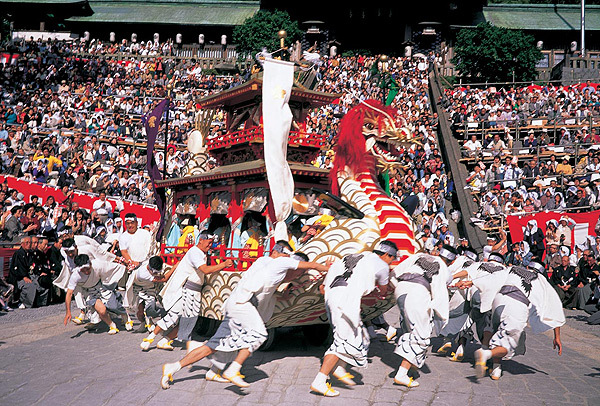 The festival feature presentation is the shachi-daiko, is a float embellished with a shachi, a legendary golden fish often used as a motif on castle roof tiles. 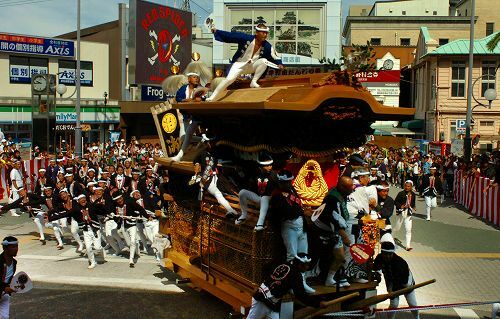 This float is carried after the style of the kokkodesho and rocked about. It is accompanied by a drum band. Nagasaki has many distinctive dishes some of which show a strong Chinese influence. 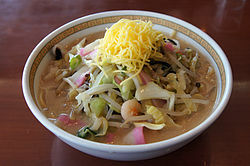 There is, for example, champon, a dish made by frying pork, seafood and vegetables with lard and then adding them to a soup made with chicken and pork bones. Ramen noodles made especially for champon are added and then boiled. Unlike other ramen dishes, only one pan is needed as the noodles are boiled in the soup. Depending on the season and the situation, the ingredients differ. There is sara udon consisting of a base of noodles, and a topping of fried cabbage, bean sprouts and other vegetables, as well as squid, prawns, pork, kamaboko (processed fish cake) etc. 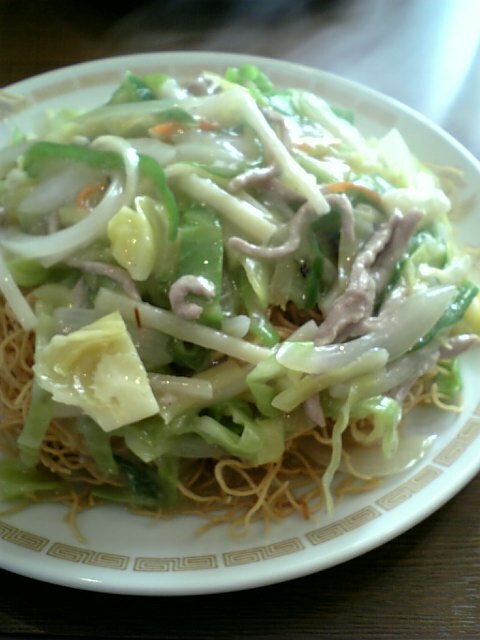 There are two main varieties of noodles, thinner crispy noodles fried in oil (called pari pari, bari bari, or bari men); as a result this variation is reminiscent of Cantonese-style Chow Mein. 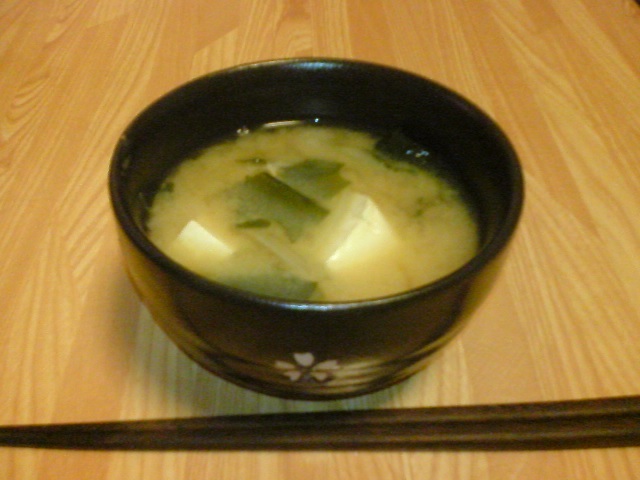 Japanese cooking does take some practice to get it right, but miso soup is not hard to make, so that is my recipe of the day. You’ll need a good Asian market for some of the ingredients. I’ll just give you an informal recipe. The base of many Japanese soups and sauces is dashi, a broth made from bonito flakes and seaweed. It is easy enough to make but you can also buy dashi powder which you simmer quickly in water to reconstitute it. Make about a liter of dashi following the instructions on the pack. Bring to a gentle simmer and add what ingredients you wish. Classic ones are cubes of tofu and wakame seaweed. But you can also add mushrooms, shrimp, fish, potatoes, daikon and so forth. You should aim to have an ingredient that floats and one that sinks, and combine strong flavors with delicate ones. Add the uncooked ingredients first and simmer them until done. Then add the cooked ones and heat them through. Take the pot off the stove and add about 4 tablespoons of miso paste (red or white as you wish). Stir well to distribute the paste. It is important not to cook it as this changes the flavor and destroys some of the beneficial nutrients. Serve in bowls with chopsticks. It is customary to drink the broth directly from the bowl.